Why Choose Clarity Enhanced Diamonds? Clarity enhanced diamonds undergo a special touch up procedure that allows more light to enter the diamond and consequently results in an even more brilliant sparkle. Affordability is just one more reason to say “I do” to clarity enhanced diamond rings. These diamonds are typically purchased for ⅓ less than the carat price of comparable, non enhanced diamond. When you buy clarity enhanced diamond rings you can get more for your money with a brilliant sparkle that continues to gives diamonds their everlasting mass appeal. Classic stud earrings with 2ct t.w. round brilliant, clarity enhanced diamonds. This perfect ring features a clarity enhanced 1.0ct diamond surrounded by fully faceted pave’ set white diamonds in 14kt white gold. This one-of-a-kind heirloom creation of 14kt white gold features a 3.41ct ashcher cut clarity enhanced diamond with 1.13ct t.w. 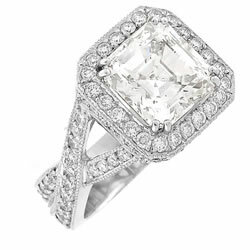 of fully faceted pave’ set white diamonds. Clarity Enhanced Diamonds – Are they for You? During a slowly recovering economy, we offer our customers as many affordable and beautiful options as possible. One the smartest choices for the budget conscious are our clarity enhanced diamonds, though they’re often overlooked because many just don’t understand what they are. Clarity enhanced diamonds are diamonds with minor inclusions that undergo a special “touch up” procedure that allows more light to enter the diamond and consequently results in an even more brilliant sparkle. These diamonds are typically purchased for ⅓ less than the carat price of comparable, non enhanced diamond. When you buy clarity enhanced diamond rings you can get more for your money with a brilliant sparkle that continues to gives diamonds their everlasting mass appeal…a definite win/win! This perfect ring features a clarity enhanced 1.0ct diamond surrounded by fully faceted pave set white diamonds in 14kt white gold. Available Stone Size: .50ct – 4.0ct t.w. Simply elegant in its framing of .65ct t.w. of white fully faceted diamond pave, this rare fancy yellow clarity enhanced square radiant cut diamond of 1.50 carats is the perfect gift she will forever treasure! Clarity enhanced diamonds undergo a special “touch up” procedure that allows more light to enter the diamond and consequently results in an even more brilliant sparkle. Affordability is just one more reason to say “I do” to clarity enhanced diamond rings. These diamonds are typically purchased for one third less than the carat price of comparable, non- enhanced diamond. When you buy clarity enhanced diamond rings, you can get more for your money with a brilliant sparkle that continues to gives diamonds their everlasting mass appeal. There are two types of procedures that will improve the clarity of a diamond. The first is called laser drilling and the second is called fracture filling (more commonly known as clarity enhancement). Both are considered clarity enhanced diamonds. All diamonds besides flawless diamonds will have internal characteristics commonly known as inclusions, including black carbon spots, feathers, clouds, bubbles and more. Laser drilling creates a minute hole in the diamond, allowing for black carbon spots to be cleaned out. This type of enhancement is permanent, which is both an advantage and disadvantage. On the one hand, the tiny holes, although not visible to the naked eye, will always be in the diamond. On the other hand, the diamond will be clearer for good. Fracture filling, despite its name, does not mean that the diamond is broken or cracked, rather that the original inclusions are coated with a clear substance to make them invisible to the naked eye. Diamonds that are filled are cleaned and boiled to remove any dirt and other imperfections, and then they are filled with a microscopic amount of clear material that cloaks the feathers. There are two types of filling used for clarity enhancement. One using bromide and the other using a silicone based material. The former is the lower quality treatment and can discolor or fade over time. The higher quality treatment can last a lifetime so long as it isn’t exposed to extreme heat (over 1500 degrees) or acid.